Today the kids wanted me to build a fire and cook something! Now, I have never been very good at building fires, more especially getting them to stay lit! 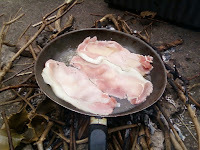 But after success last week - toasted bread and one very overdone jacket potato, I decided to get some bacon and cook that. The photo is taken in our back yard, as this was more sheltered than the front garden. Back bacon - the leanest sort - unless you particularly like lots of fat then it is the best cut to go for. Anyway, successfully cooked 6 slices of bacon although had to get the fire going again mid way through as the embers were cooling down too much for cooking on, and then popped two eggs in and my kids and a friend of theirs ate their way through bacon and fried egg butties!